and consented to the resumption of the drive on Moscow. But too late! central front within eight to ten days', the Supreme Commander ordered. Moscow and bring the Soviet Union tumbling down. But here again the Nazi dictator became victim of his megalomania. "laughed aloud" at such ridiculous orders, was soon to find the contrary. 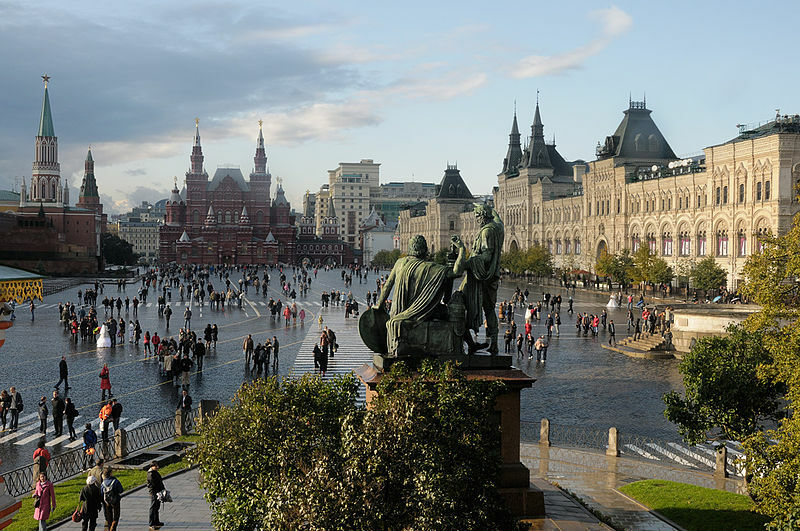 weather Moscow could be taken before the severe Russian winter set in. beginning to make their presence felt in the vast forests and swamps. Supply columns were frequently ambushed..."
long. Both Kleist and Rundstedt realised that Rostov could not be held. I am acceding to your request. Please give up your command." "I then," said Rundstedt , "went home." 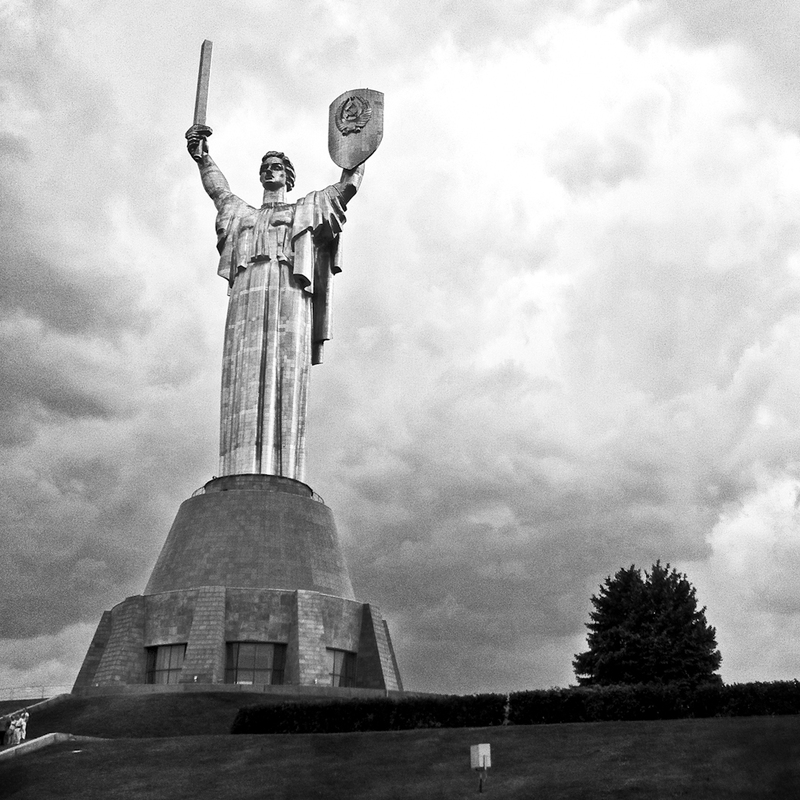 to lead to Stalingrad and other disasters and help to seal Hitler's fate. Heavy snows and subzero temperatures came early that winter in Russia. bitter cold affected guns and machines as well as men. can truly judge the events which now occurred." military force they had almost ceased to exist." a motley force of hastily mobilized workers from the city factories. first and last glimpse of the Kremlin. our troops is at an end." tried to remind him that "the best defence was to stick to the attack." It was easier said than done, in view of the Russians and the weather. soldier that saved the armies of the Third Reich from complete debacle. failure was greater than that. Halder realized this, at least later. Even the obsequious Keitel was in trouble with the Supreme Commander. insults, which he did, with amazing endurance, to the very end. was carried out at 7:13 am on 23 July 1944 in Germersheim, Germany. his father was executed, held a requiem at his father's grave. March 20, 1942). a vain, cowardly wretch... and a nincompoop. that he himself was taking over as Commander in Chief of the Army. running the Army, as he ran almost everything else in Germany. the Tři Trubky hunting lodge in the Brdy mountains southwest of Prague. statement condemning the attempt on Hitler's life. died in Hamburg in 1948 before he could be prosecuted. across the open country since roads and tracks were blocked with snow. rear at headquarters, and it is graphically recorded in Halder's diary. serious situation of the various armies. if any more withdrawals necessary..."
Not the Führer but the Russian Army was by now deciding such matters. 7. Perhaps it was too cold. At any rate nothing came of the suggestion. these 202,251 had been killed, 725,642 wounded and 46,511 were missing. 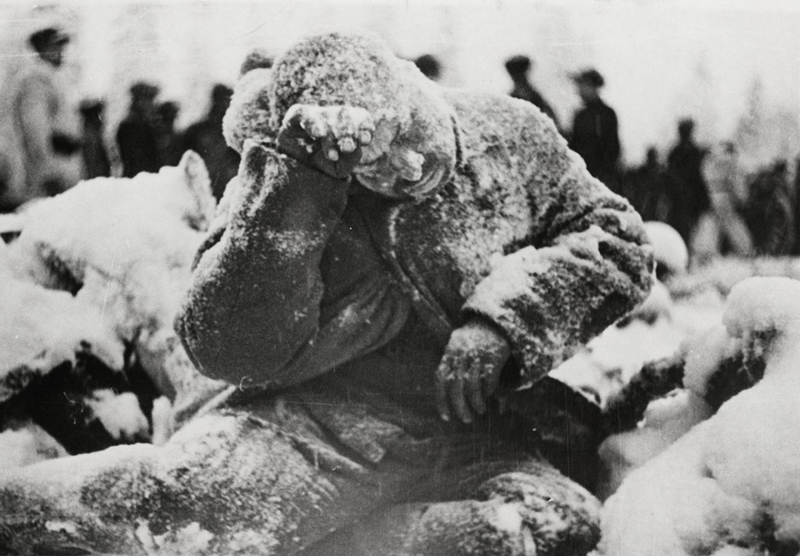 losses among Hungarians, Romanians and Italians in Russia. Russia down this year and has already turned his thoughts to next year. Halder jotted down the Leader's ideas. this year's campaign, Vologda or Gorki, but only at the end of May. other and this will lead to peace negotiations. soldier, his face, hands and clothing covered with a dusting of snow. had come to keep it, or break it. There is a curios notation in Halder's diary for the first day of the attack on Russia. After mentioning that at noon the Russian radio stations, which the the Germans were monitoring, had come back on the air, he writes: "They have asked Japan to mediate the political and economic differences between Russia and Germany, and remain in serious contact with the German Foreign Office". Did Stalin believe, nine hours after the attack, that he somehow might it called off?. By the beginning of autumn 1941, Hitler believed that Russia was finished. Within three weeks of the opening of the campaign, Field Marshal von Bock's Army Group Centre, with thirty infantry divisions and fifteen panzer or motorized divisions, had pushed 450 miles from Bialistock to Smolensk. 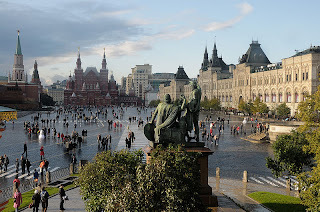 Moscow lay about 200 miles further east along the high road which Napoleon had taken 1812. 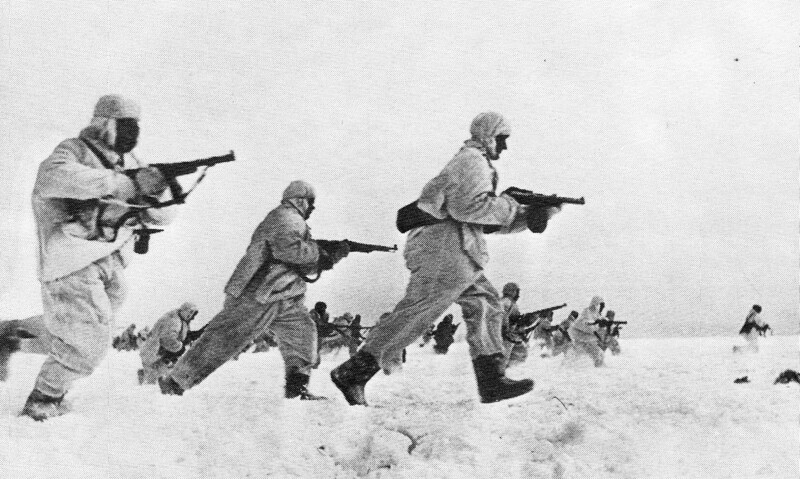 To the north Field Marshal von Lebb's army group, twenty-one infantry and six armoured division strong, was moving rapidly up through the Baltic States toward Leningrad. To the south Field Marshal von Rundstedt's army group of twenty-five infantry, four motorised, four mountain and five panzer divisions was advancing toward the Dnieper River and Kiew, the capital of the fertile Ukraine, which Hitler coveted. So planmäßig (according to plan), as the OKW puts it, was the German progress along a thousand mile front from the Baltic to the Black Sea, and so confident was the Nazi dictator that it would continue at an accelerated pace as one Soviet army after another was surrounded or dispersed, that on July 14, a bare three weeks after the invasion had begun, he issued a directive advising that the strength of the Army could be 'considerably reduced in the near future' and that armament production would be concentrated on naval ships and Luftwaffe planes, especially the latter, for the conduct of the war against the last remaining enemy, Britain, and, he added, 'against America should the case arise'. BY the end of September he instructed the high Command to prepare to disband forty divisions so that this additional manpower could be utilized by industry. 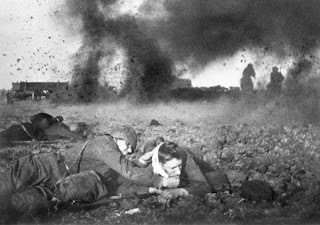 Ruins of Minsk - July 1941 'The Soviet troops trapped in the gigantic pockets continued fighting, and concluding operations resulted in high German casualties. Many Soviet troops escaped due to the lack of German infantry troops' motor transport that slowed the encirclement process.The Polish institute of National remembrance claims that withdrawing Soviet troops committed regular crimes against the inhabitants of Białystok and its areas, including cases of whole families being executed by firing squads.On conclusion, 290,000 Soviet soldiers were captured, and 1,500 guns along with 2,500 tanks were destroyed, but 250,000 Soviet troops managed to escape (most of the prisoners would be dead within a few months because of inhumane conditions at the POW enclosures). 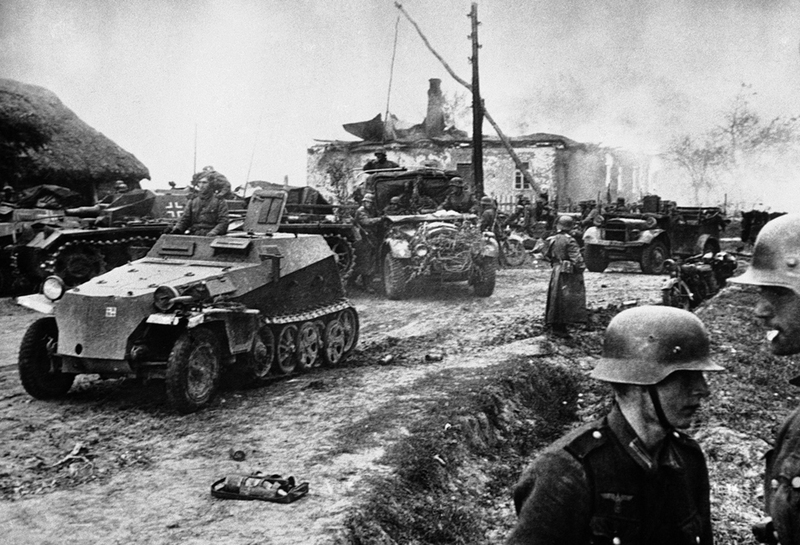 The quick advance East created the possibility for the Wehrmacht to advance rapidly towards the land bridge of Smolensk, from which an attack on Moscow could be planned. It also created the impression in the OKW that the war against the Soviet Union was already won, within days of its start. 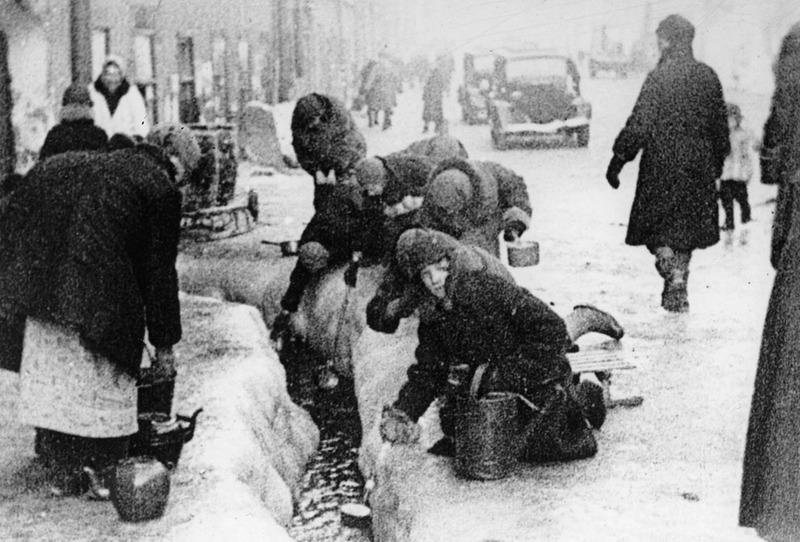 This photo, taken in the winter months of 1942, shows citizens of Leningrad as they dip for water from a broken main, during the nearly 900-day siege of the Russian city by German invaders. 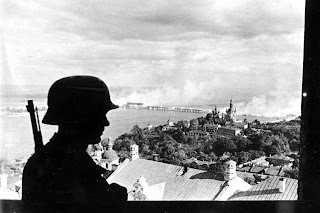 Unable to capture the Leningrad (today known as Saint Petersburg), the Germans cut it off from the world, disrupting utilities and shelling the city heavily for more than two years. That same week, on October 3, Hitler returned to Berlin and in an address to the German people proclaimed the collapse of the Soviet Union. 'I declare today, and I declare it without any reservation'. he said, ' that the enemy in the East has been struck down and will never rise again...Behind our troops there already lies a territory twice the size of the German Reich when I came to power in 1933'. 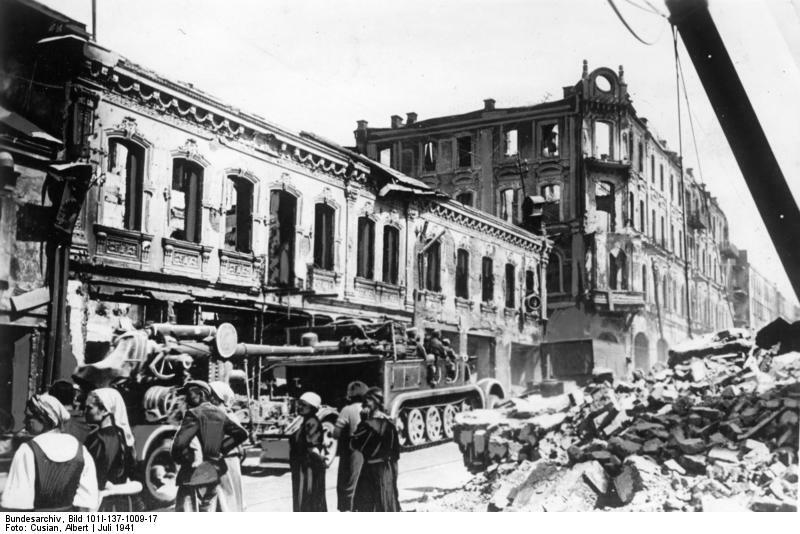 When on October 8, Orel, a key city south of Moscow fell, Hitler sent his press chief, Otto Dietrich, flying back to Berlin, to tell the correspondents of the world's leading newspapers there the next day that the last intact Soviet armies, those of Marshal Timoshenko, defending Moscow, were locked in two steel German pockets before the capital, that the southern army of Marshal Budenmy were routed and dispersed, and that sixty to seventy divisions of Marshal Voroshilov's army were surrounded in Leningrad. For all military purposes', Dietrich concluded smugly, 'Soviet Russia is done with. The British dream of a two-front war was dead'. These public boasts of Hitler and Dietrich were, to say the least, premature. 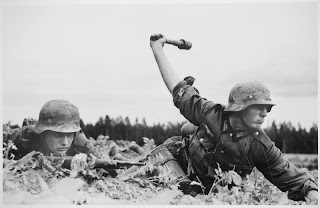 In reality the Russians, despite the surprise with which they were taken on June 22, their subsequent heavy losses in men and equipment, their rapid withdrawal and the entrapment of some of their best armies, had begun in July to put up a mounting resistance such as the Wehrmacht had never encountered before. 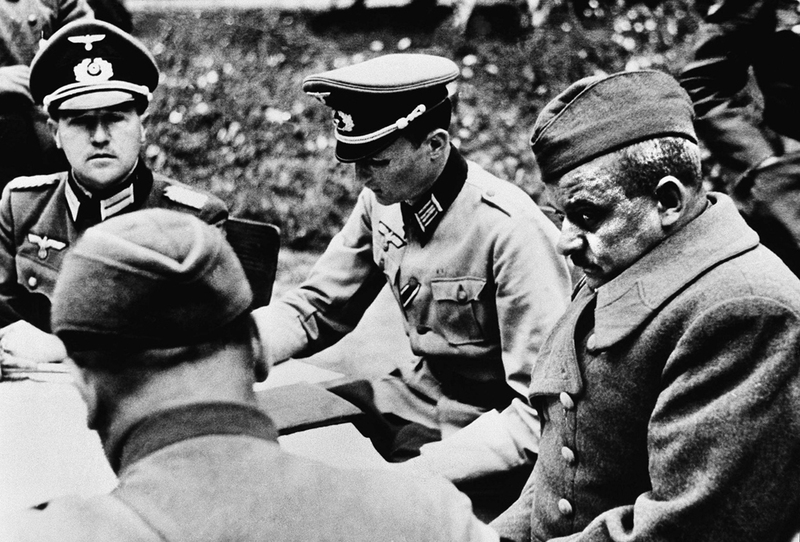 Halder' diary and the reports of such front line commanders as General Guderian, who led a large panzer group on he central front, began to be peppered, and then laden, with accounts of server fighting, desperate Russian stands and counter-attacks and heavy casualties to German as well as Soviet troops. December 1941. 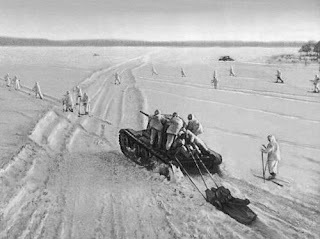 Soviet troops in winter gear, supported by tanks, counter-attack German forces. 'The conduct of the Russian troops', General Blumentritt wrote later, 'even in the first battle (for MInsk) was in striking contrast to the behaviour of the Poles and the Western Allies in defeat. Even when encircled the Russians stood their ground and fought'. And there proved to be more of them, and with better equipment, than Adolf Hitler had dreamed was possible. Fresh Soviet divisions which the German intelligence had no inkling of were continually being thrown into battle. 'It's becoming ever clearer', Halder wrote in his diary on August 11, that we underestimated the strength of the Russian colossus not only in the economic and transportation sphere but above all in the military. At the beginning we reckoned with some 200 enemy divisions and we have already identified 360. When a dozen of them are destroyed the Russians throw in another dozen. On this broad expanse our front is too thin. It has no depth. As a result , the repeated enemy attacks often met with some success'. Rundstedt put it bluntly to Allied interrogators after the war. 'I realized', he said, 'soon after the attack began that everything that had been written about Russia was nonsense'. Seveal generals, Guderian, Blumentritt and Sepp Dietrich among them, have left reports expressing astonishment at their first encounter with the Russian T-34 tank, of which they had not previously heard and which was so heavily armoured that the shells from German anti-tank guns bounced harmlessly off it. The appearance of this panzer, Blumentritt said later, marked the beginning of what came to be called the 'tank terror'. Also for the first time in the war, the Germans did not have the benefit of overwhelming superiority in he air to protect their ground troops and scout ahead. Despite the heavy losses on the ground in the first day of the campaign and in early combat, Soviet fighter planes kept appearing, like he fresh divisions, out of nowhere. 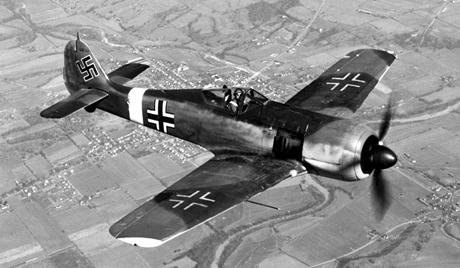 Moreover, the swiftness of the German advance and the lack of suitable airfields in Russia left the German fighter base too far back to provide effective cover at the front. "At several stages in the advance", General von Kleist later reported, "my panzer forces were handicapped through lack of cover overhead". There was another German miscalculation about the Russians which Kleist mentioned to Liddell Hart which, of course, was shared by most of the other peoples of the West that summer: "Hopes of victory", Kleist said, "were largely built on the prospect that the invasion would produce a political upheaval in Russia... Too high hopes were built on the belief that Stalin would be overthrown by his own people if he suffered heavy defeats. The belief was fostered by the Führer's political advisers. Indeed Hitler told Jodl. "We have only to kick in the door and the whole rotten structure will come crashing down". T-34 Russian Tank'. The USSR was able to produce T-34s in a seemingly endless stream. 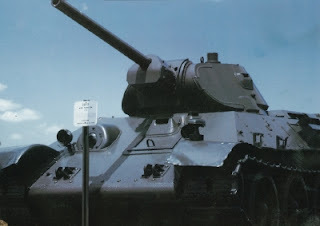 Between 1940 and 1945 some 40,000 T-34 tanks were manufactured. 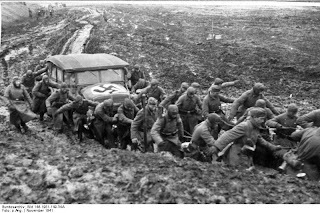 The opportunity to kick in the door seemed to the Führer to be at hand halfway through July when there occurred the first great controversy over strategy in the German High Command and led to a decision by the Führer, over the protests of most of the top generals, which Halder thought proved to be " the greatest strategic blunder of the Eastern campaign". The issue was simple but fundamental. 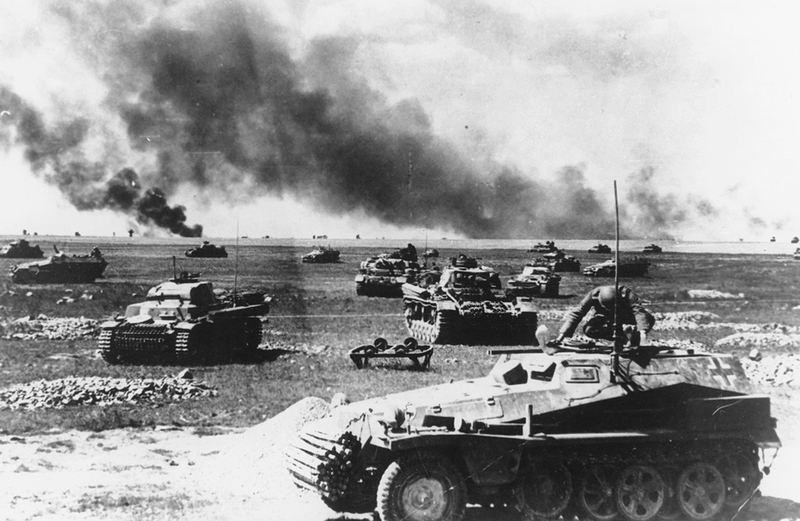 Should Beck's Army Group Center, the most powerful and so far the most successful of the three main German Armies, push on the two hundred miles to Moscow from Smolensk, which it ha reached on July 16? Or should the original plan, which Hitler laid down in December 18 directive, and which called for the main thrust on the north and south flanks, be adhered to? In other words, was Moscow the prize goal, or Leningrad and the Ukraine? The Army High Command, led by Brauchitsch and Halder and supported by Bock, whose central Army group was moving up the main highway to Moscow, and by Guderian, whose panzer forces were leading it, insisted on an all-out drive for the Soviet capital. There was much more to their argument that merely stressing the psychological value of capturing the enemy capital. 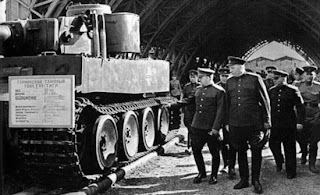 Moscow they pointed out to Hitler, was a vital source of armament production and communication system. Take it, and the Soviets would not only be deprived of an essential source of arms but would be unable to move troops and supplies to the distant fronts, which thereafter would weaken, wither and collapse. But there was a final conclusive argument which the Generals advanced to the former corporal who was now their Supreme Commander. All their intelligence reports showed that the main Russian forces were now being concentrated before Moscow for an all-out defence of the capital. 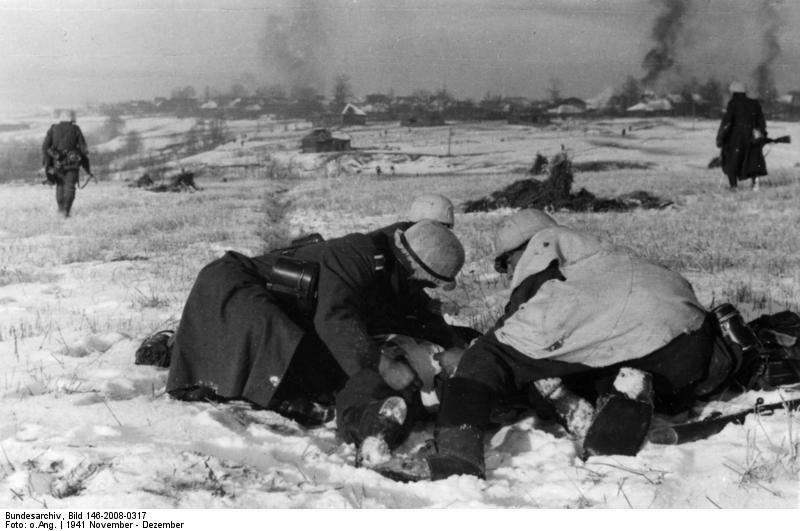 Just east of Smolensk a Soviet army of half a million men, which had extricated itself from Bock's double envelopment, was digging in to bar further German progress toward the capital. The centre of gravity of Russian strength (Halder wrote in a report prepared for the Allies immediately after the war) was therefore in front of Army Group Centre... 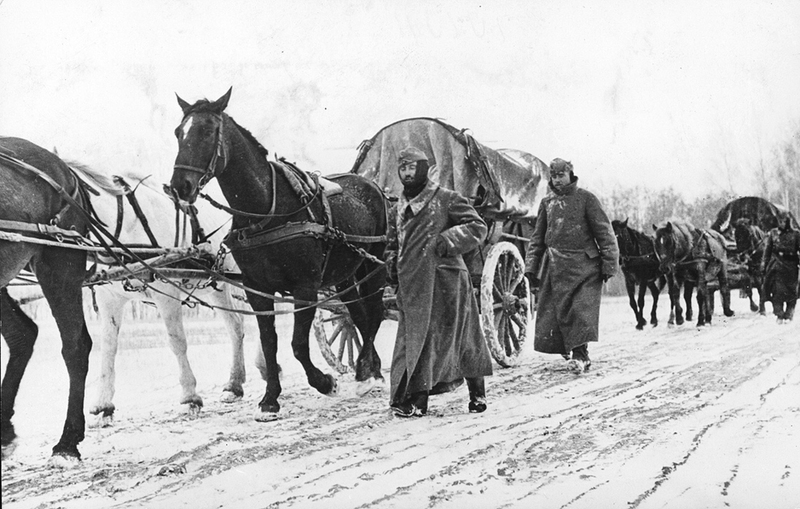 The General Staff had been brought up with the idea that it must be the aim of an operation to defeat the military power of the enemy, and it therefore considered the next and most pressing task to be to defeat the forces of Timoshenko by concentrating all available forces at Army Group Centre, to advance on Moscow, to take this nerve centre of enemy resistance and to destroy the new enemy formations. The assembly for this attack had to be carried out as soon as possible because the season was advanced. 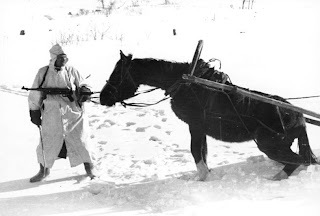 Army Group North was in the meantime to fulfil its original mission and try to contact the Finns. Army Group South was to advance farther East to tie down the strongest possible enemy force.... After oral discussion the General Staff of the Supreme Command (OKW) had failed, the Commander in Chief of the Army (Brauchitsch) submitted a memorandum of the General Staff to Hitler. This was done on August 18. "The effect", says Halder. "was explosive". Hitler had is hungry eyes on the food belt and industrial areas of the Ukraine and on the Russian oil fields just beyond the Caucasus. Besides he thought he saw the golden opportunity to entrap Budenmy's armies east of the Dnieper beyond Kiew, which still held out. He also wanted to capture Leningrad and join up with the Finns in the north. To accomplish these twin aims, several infantry, and several infantry and panzer divisions from Army Group Centre would have to be detached and seer north and especially south. Moscow could wait. On August 21, Hitler hurled a new directive at his rebellious General Staff. Halder copied it out word for word in his diary the next day. 'The proposals of the Army for the continuation of the operation in the East do not accord with my intentions. The most important objective to attain before the onset of winter is not the capture of Moscow but taking the Crimea, the industrial and coal-mining areas of the Donets basin and cutting off of Russian oil supplies from the Caucasus. In he north it is the locking up of Leningrad and the union with the Finns'. 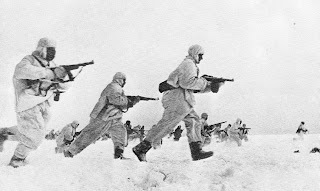 The Soviet Fifth Army on the Dnieper in the south, whose stubborn resistance had annoyed Hitler for several days, must, he laid down, be utterly destroyed, the Ukraine and Crimea occupied, Leningrad surrounded and a junction with the Finns achieved. "only then", he concluded, "will the conditions created whereby Timoshenko's Army can be attacked and successfully defeated". Thus (commented Halder bitterly) the aim of defeating decisively the Russian armies in front of Moscow was subordinated to the desire to obtain a valuable industrial area and to advance in the direction of Russian oil... Hitler now became obsessed with the idea of capturing both Leningrad and Stalingrad, for he persuaded himself that these two 'holy cities of Communism' were to fall, Russia would collapse. To add insult to injury to the field marshals and the generals who did not appreciate his strategic genius, Hitler sent what Halder called a "counter-memorandum" (To that of the Army of the eighteenth), which the General Staff Chief as "full of insults', such as stating that the Army High Command was full of "minds fossilized in out-of-date theories". "Unbearable! Unheard of! The limit!' Halder snorted in his diary the next day. 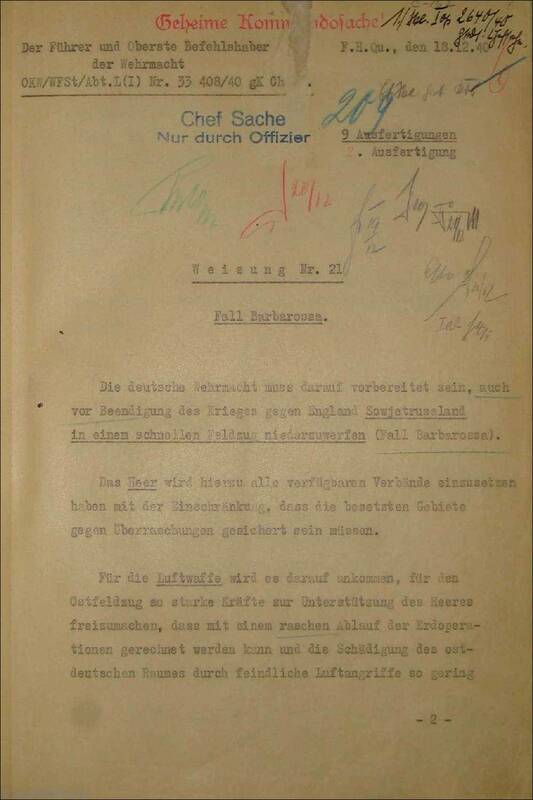 He conferred all afternoon ans evining with Field Marshall von Brauchitsch about the Führer's "inadmissible" mixing into the business of the Army High Command and General Staff, finally proposing that the head of the Army and he himself resign their posts. "Brauchitsch refused", Halder noted, "because it wouldn't be practical and change nothing". The gutless Field Marshall had already, as on so many other occasions, capitulated to the one-time corporal. When General Guderian arrived at the Führer's headquarters the next day, August 23, and was egged on by Halder to try to talk Hitler out of this disastrous decision, though the hard bitten panzer leader needed no urging, he was met by Brauchitsch. "I forbid you", the Army Commander in Chief said, "to mention the question of Moscow to the Führer. The operation south has been ordered. The problem now simply how it is carried out. Discussion is pointless". 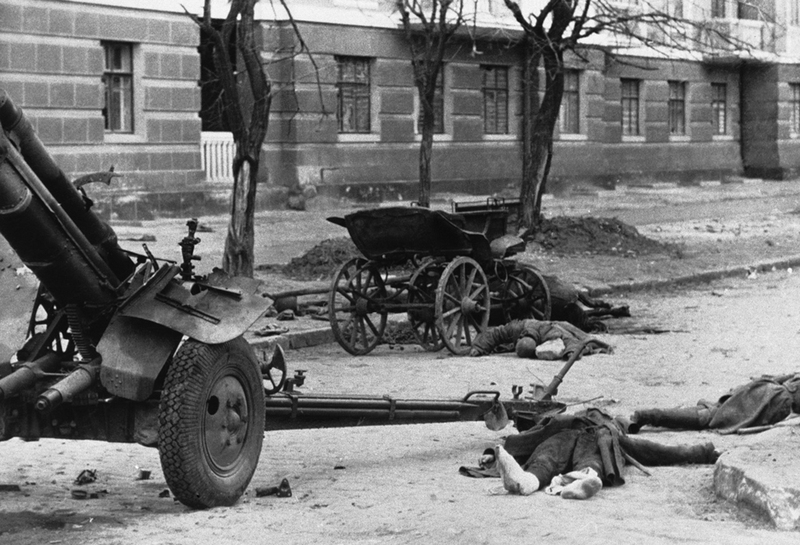 German mechanized troops rest at Stariza, Russia on November 21, 1941, only just evacuated by the Russians, before continuing the fight for Kiev. The gutted buildings in the background testify to the thoroughness of the Russians "scorched earth" policy. 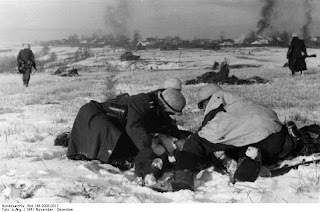 This was the most severe crisis in the German Military Command since the beginning of the war. Worse were to follow, with adversity. In itself Rundstedt's offensive in the south, made possible by the reinforcement of Guderian's panzer forces and infantry divisions withdrawn from the central front, was, as Guderian put it, a great tactical victory. Kiev itself fell on September 19, German units had already penetrated 150 miles beyond it, and on the twenty-sixth the battle of Kiev ended with the encirclement and surrender of 665,000 Russian prisoners, according to German claims. To Hitler it was "the greatest battle in the history of the world", but though it was a singular achievement some of his Generals were sceptical of its strategic significance. Bock's armour-less army group in the centre had been forced to cool its heels for two months along the Desna River just beyond Smolensk. The autumn rains, which would turn the Russian roads into quagmires, were drawing near. And after them, the winter, the cold and the snow. "Stalin publicly asked for me (Schulenburg wired)... and threw his arm around my shoulders: 'We must remain friends and you must now do everything to that end'! Somewhat later Stalin turned to the acting German Military Attaché, Colonel Krebs, first made sure that he was a German, and then said to him: 'We will remain friends with you,through thick and thin'! Three days later the German chargé in Moscow, Tippelskirch, wired Berlin stressing that the demonstration at the station showed Stalin's friendliness toward Germany and this was especially important 'in view of the persistently circulation rumours of an imminent conflict between Germany and the Soviet Union'. The day before, Tippelskirch had informed Berlin that the Kremlin had accepted 'unconditionally', after months of wrangling, the German proposals for the settlement of the border between the two counties from the Igorka River to the Baltic Sea. 'The compliant attitude of the Soviet Government', he said, 'seems very remarkable.' In view of what was brewing in Berlin, it surely was. In supplying blockaded Germany with important raw materials, the Soviet Government continued to be equally compliant. On April 5, 1941, Schnurre, in charge of trade negotiations with Moscow, reported jubilantly to his German masters that after the slowdown in Russian deliveries in January and February 1941, due to a 'cooling off of political relations', they had risen 'by leaps and bounds in March, especially in grains, petroleum, manganese ore and the non-ferrous and precious metals'. Transit traffic through Siberia, he added is proceeding favourable as usual. 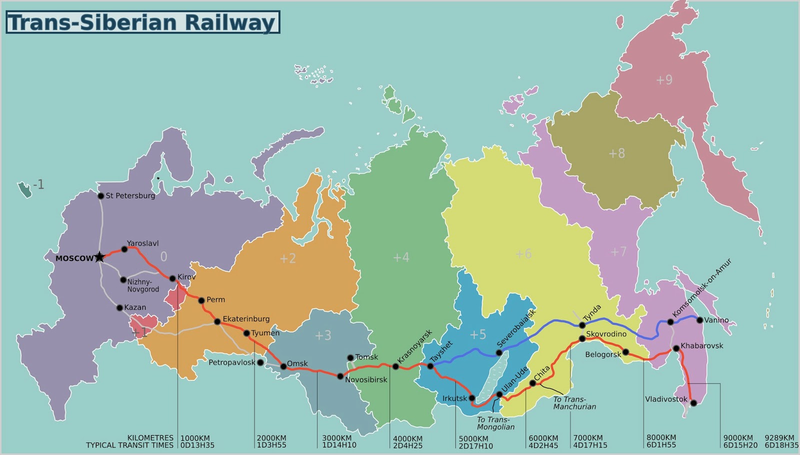 At our request the Soviet Government even put a special freight train for rubber at our disposal at the Manchurian border. 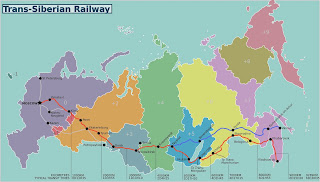 Six weeks later, on May 15, Schnurre was reporting that the obliging Russians had put on special freight trains so that 4,000 tons of badly needed raw rubber could be delivered to Germany over the Siberian railway. German deliveries of Machinery to Russia were falling behind, Schnurre observed, but he did not seem to mind if the Russians didn't. However, he was disturbed on May 15 by another factor. 'Great difficulties are created', he complained, 'by the countless rumours of an imminent German-Russian conflict', for which he blamed German official sources. Amazingly, the "difficulties", Schnurre explained in a lengthy memorandum to the Foreign Office, did not come from Russia but from German industrial firms, which, he said, were trying "to withdraw" from their contracts with the Russians. Hitler, was doing his best to contradict the rumours, but at the same time he was busy trying to convince his generals and top officials that Germany was in growing danger of being attacked by Russia Though the generals, from their own military intelligence, knew better, so hypnotic was Hitler's spell over them that even after the war Halder Brauchitsch, Mannstein, and others (although not Paulus, who seems to have been more honest) contended that a Soviet military build-up on the Polish frontier had become very threatening by the beginning of the summer. 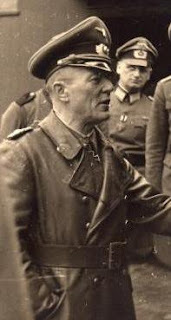 Count von der Schulenburg, who had come home from Moscow on a brief leave, saw Hitler in Berlin on April 28 and tried to convince him of Russia's peaceful intentions. 'Russia", he attempted to explain, 'is very apprehensive at the rumours predicting a German attack on Russia. I cannot believe', he added, 'that Russia will ever attack Germany... If Stalin was unable to go with England and France in 1939 when both were still strong, he will certainly not make such a decision today, when France is destroyed and England badly battered. On the contrary, I am convinced that Stalin is prepared to make even further concessions to us'. The Führer feigned scepticism. He had been 'forewarned', he said, 'by events in Serbia...What devil had possessed the Russians', he asked, 'to conclude the friendship pact with Yugoslavia?' He did not believe, it was true, he said, that 'Russia could be brought to attack Germany'. Nevertheless, he concluded, he was obliged 'to be careful'. Hitler did not tell the ambassador to the Soviet Union what plans he had in store for that country, and Schulenburg, an honest, decent German of the old school, remained ignorant of them to the last. Stalin, too, but not of the signs, or of the warnings, of what Hitler was up to. On April 22 the Soviet Government formerly protested eighty instances of border violations by German planes which it said had taken place between March 27 and April 18, providing accounts of each. In one case, it said, in a German reconnaissance plane which landed near Rovno on April 15 there was found a camera, rolls of exposed film and a torn topographical map of western districts of the U.S.S.R., 'all of which give evidence of the purpose of the crew of this airplane'. Even in protesting the Russians were conciliatory. 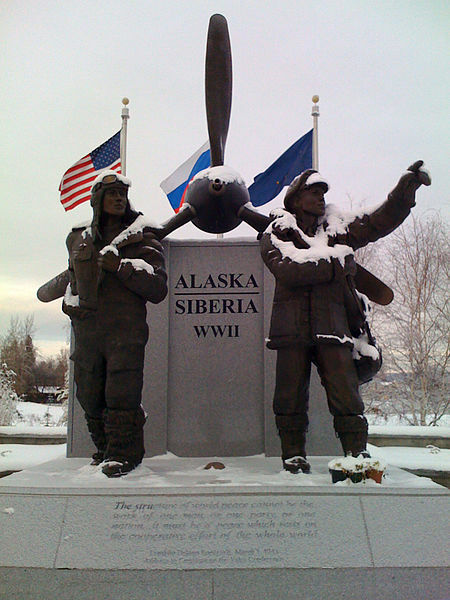 They had given the border troops, the note said, 'the order not to fire on German planes flying over Soviet territory so long as such flights do not occur frequently. Stalin made further conciliatory moves in May. To please Hitler he expelled the diplomatic representatives in Moscow of Belgium, Norway, Greece and even Yugoslavia and closed their legations. He recognized the pro-Nazi government of Rashid Ali in Iraq. He kept the Soviet press under strictest restraint in order to avoid provoking Germany. 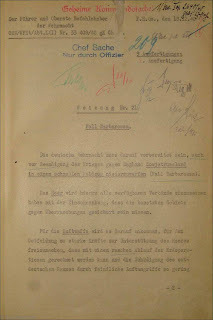 'These manifestations, Schulenburg wired to Berlin on May 12, of the intention of the Stalin Government are calculated... to relieve the tension between the Soviet Union and Germany and to create a better atmosphere for the future. We must bear in mind that Stalin personally has always advocated a friendship between Germany and the Soviet Union'. Though Stalin had long been absolute dictator of the Soviet Union this was the first mention by Schulenburg in his dispatches of the term "Stalin Government". There was good reason. On May 6 Stalin had personally taken over as Chairman of the Council of People's Commissars, or Prime Minister, replacing Molotov, who remained as Foreign Commissar. 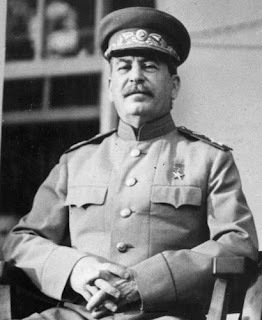 This was the first time the all-powerful secretary of the Communist Party had taken government office and the general world reaction was that it meant the situation had become so serious for the Soviet Union, especially in its relation with Germany, that only Stalin could deal with it as the nominal as well as the actual head of government. This interpretation was obvious, but there was another which was not so clear but which the astute German ambassador in Moscow promptly pointed out to Berlin. Stalin, he reported, was displeased with the deterioration of German- Soviet relations and blamed Molotov's clumsy diplomacy for much of it. 'In my opinion, schulenburg said, it may be assumed with certainty that Stalin has set himself a foreign-policy goal of overwhelming importance...which he hopes to attain by his personal efforts. I firmly believe that in an international situation which he considers serious, Stalin has set himself the goal of preserving the Soviet Union from a conflict with Germany'. Did the crafty Soviet dictator not realize by now, the middle of May 1941, that this was an impossible goal, that there was nothing, short of an an abject surrender to Hitler, that he could do to attain it? He surely knew the significance of Hitler's conquest of Yugoslavia and Greece, of the presence of large masses of German troops in Rumania and Hungary on his southwest borders, of the Wehrmacht build-up on his western frontier in Poland. The persistent runors in Moscow itself surely reached him. By the beginning of May what Schulenburg called in a dispatch on the second dau of that month 'rumours of an imminent German-Russian military show-down" were so rife in the Soviet capital that he and his officials in the German Embassy were having difficulty in combating them. 'Please bear in mind, he advised Berlin, that attempts to counteract these rumours here in Moscow must necessarily remain ineffectual if such rumours incessantly reach here from Germany, and if every traveller who comes to Moscow, or travels through Moscow, not only brings these rumours along, but can even confirm them by citing facts'. The veteran ambassador was getting suspicious himself. He was instructed by Berlin to continue to deny the rumours, and to spread it about that not only was there no concentration of German troops on Russia's frontiers but that actually considerable forces (eight divisions, he was told for his 'personal information') were being transferred from 'east to west'. Perhaps these instructions only confirmed the ambassador's uneasiness, since by this time the press throughout the world was beginning to trumpet the German build-up along the Soviet borders. But before this, Stalin had received specific warnings of Hitler's plans, and apparently paid no attention to them. The most serious one come from the government of the United States. Early in January 1941, the U.S. commercial attaché in Berlin Sam E. Woods, had sent a confidential report to the State Department stating that he had learned from trustworthy German sources that Hitler was making plans to attack Russia in the spring. 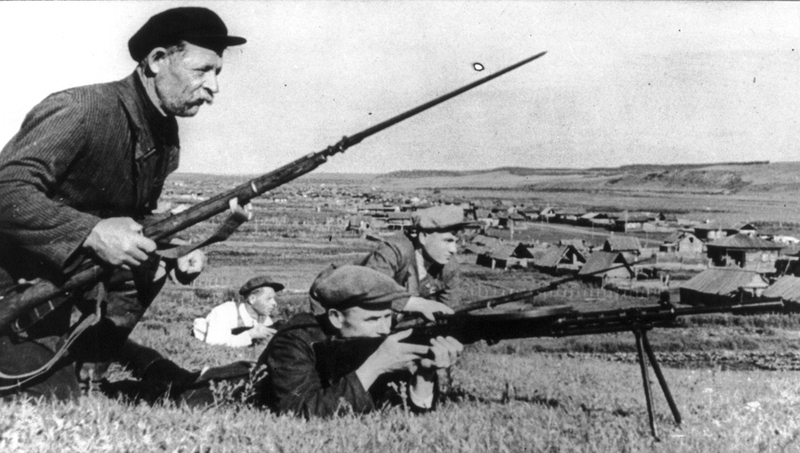 It was a long and detailed message, outlining the General Staff plan of attack (which proved to be quite accurate) and preparations being made for the economic exploitation of the Soviet Union, once it was conquered. Secretary of State Cordell Hull thought at first that Woods had been victim of a German 'plant'. He called in J. Edgar Hoover. The F.B.I. had read the report and judged it authentic. Woods had named some of his sources, both in various ministries in Berlin and in the German General Staff, and on being checked they were adjudged in Washington to be men who ought to know what was up and anti-Nazi enough to tattle. Despite the strained relations then existing between the American and Soviet governments Hull decided to inform the Russians, requesting Under-secretary of State Summer Welles to communicate the substance of the report to Ambassador Constantine Oumansky. This was done on March 20. Mr. Oumansky turned very white , Welles later wrote. He was silent for a moment and then merely said: "I fully realise the gravity of the message you have given me. My government will be grateful for your confidence and I will inform it immediately of our conversation. [The American consul in Königsberg (East Prussia), Koykendall, relayed a report specifying correctly the exact day the attack would begin. sic] If it was grateful, indeed if it ever believed this timely intelligence, it never communicates any inkling to the American government. In fact, as Secretary Hull related in his memoirs, Moscow grow more hostile and truculent because America's support of Briton made it impossible to supply Russia with all the materials it demanded. Nevertheless, according to Hull, the State Department, having received dispatches from its legations in Bucharest and Stockholm the first week in June stating Germany would invade Russia within a fortnight, forwarded copies of them to Ambassador Steinhardt in Moscow, who turned them over to Molotov. Churchill too sought to warn Stalin. On April 3 he asked his ambassador in Moscow, Sir Clifford Cripps, to deliver a personal note to the dictator pointing out the significance to Russia of German troop movements in southern Poland which he had learned through a British agent. Cripps' delay in delivering the message still vexed Churchill when he wrote about the incident later in his memoirs. Before the end of April, Cripps knew the date for the German attack, and the Germans knew he knew it. On April 24, the German naval attaché in Moscow sent a curt message to the Navy High Command in Berlin: 'The British Ambassador predicts June 22 the day of the outbreak of the war'. This message, which is among the captured German papers, was recorded in the German Naval Diary on the same day, with an exclamation point added at the end. The Admirals were surprised at the accuracy of the British Envoy's prediction. The poor naval attaché, who like the ambassador in Moscow had not been let in on the secret, added in his dispatch that it was 'manifestly absurd.' Molotov must have thought so too. A month later, on May 22, he received Schulenburg to discuss various matters. 'He wa as amiable, self assured and well informed as ever', the ambassador reported to Berlin, and again emphasized that Stalin and Molotov, 'the two strongest men in the Soviet Union', were striving above all to avoid conflict with Germany. Hitler's detailed plan of Action "Barbarossa". Hitler signed (Anhang No. 21) War Directive No. 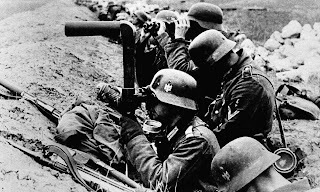 21 to the German High Command for an operation now codenamed "Operation Barbarossa" stating: "The German Wehrmacht must be prepared to crush Soviet Russia in a quick campaign. The operation was named after Emperor Frederick Barbarossa of the Holy Roman Empire, a leader of the Third Crusade in the 12th century. The invasion was set for 15 May 1941. The plan for Barbarossa assumed that the Wehrmacht would emerge victorious if it could destroy the bulk of the Red Army west of the Western Dvina and Dnieper Rivers. This assumption would be proven fatally wrong less than a month into the invasion. On one point the usually perspicacious ambassador couldn't have been more wrong. Molotov, at this juncture, was certainly not 'well informed'. But neither was the ambassador. The extent to which the Russian Foreign Commissar was ill-informed was given public expression on June 14, 1941, just a week before the German blow fell. Molotov called Schulenburg that evining and handed him the text of a Tass statement which, he said, was being broadcast that very night and published in the newspapers the next morning. Blaming Cripps personally for the widespread rumours of 'an impending war between the U.S.S.R. and Germany' in the English press", this official statement of the Soviet government branded them as an 'obvious absurdity...a clumsy propaganda maneuver of the forces arrayed against the Soviet Union and Germany". Even the recent German troop movements from the Balkans to the Soviet frontiers were explained in the communique as 'having no connection with Soviet-German relations'. As for the rumours saying that Russia would attack Germany, they were 'false and provocative'. The irony of the Tass communique on behalf of the Soviet government is enhanced by two German moves, one on the day of its publication, June 15, the other on the next day. On the afternoon of 24 July 1943, Mussolini summoned the Fascist Grand Council to its first meeting since 1939. At that meeting, Mussolini announced that the Germans were thinking of evacuating the south. This led Count Dino Grandi to launch a blistering attack on his long-time comrade. Grandi put on the table a resolution asking the king to resume his full constitutional powers—in effect, a vote leading to Mussolini's total ousting from leadership. The motion won by an unexpectedly large margin, 19-7, with Ciano voting in favour. Mussolini did not think the vote had any substantive value, and showed up at work the next morning like any other day. That afternoon, Victor Emmanuel III, the King, summoned him to Villa Savoia and dismissed him from office. Upon leaving the Villa, Mussolini was arrested. For the next two months he was moved from place to place to hide him and prevent his rescue by the Germans. Ultimately Mussolini was sent to Gran Sasso, a mountain resort in central Italy (Abruzzo). He was kept there in complete isolation until rescued by the Germans. Mussolini then set up a puppet government in the area of northern Italy still under German occupation and called it the Repubblica Sociale Italiana (R.S.I.). Ciano, having been dismissed from his post by the new government, attempted to find shelter in Germany, alongside Edda and their three children, but the Germans returned him to R.S.I. agents and he was then formally arrested for treason. Under German and Fascist pressure, Mussolini had Ciano tried [Who was his son in law, sic]. After the Verona trial sentence, a Fascist firing squad, at a shooting range in Verona on 11 January 1944, executed Ciano and others (including Emilio De Bono and Giovanni Marinelli) who had voted for Mussolini's ousting. The executed Italians were tied to chairs and shot in the back as a further humiliation. Ciano was effectively executed for dissenting against Il Duce's will. His last words were "Long live Italy!" Outdated, but serviceable U.S. destroyers sit in the Back Bay at the Philadelphia Navy Yard, on Aug. 28, 1940. Plans were well underway to bring these ships up to date and transfer them to Allied countries to aid their defence. 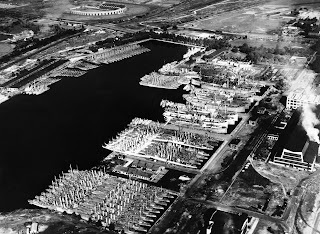 These programs would be signed into law as the Lend-Lease program in March of 1941, and would result in billions of dollars worth of war material being shipped overseas. While the Kremlin was smugly preparing to broadcast to the world on June 14, 1941, that the rumours of a German attack on Russia were an 'obvious absurdity', Adolf Hitler that very day was having his final big war conference on Barbarossa with leading officers of the Wehrmacht. The timetable for the massing of troops in the East and their deployment to the jumping-off positions had been in operation on May 22. A revised version of the timetable was issued a few days later. It is a long and detailed document and shows that by the beginning of June not only were all plans for the onslaught on Russia complete but the vast and complicated movement of troops, artillery , armour, planes, ships and supplies was well under way and on schedule. A brief item in the Naval War Diary for May 29 states: 'The preparatory movements of warships for Barbarossa has began'. Talks with the General Staff of Rumania, Hungary and Finland, the last country anxious now to win back what had been taken from her by the Russians in the winter war, were completed. 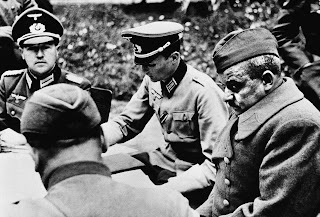 On June 9 from Berchtesgaden Hitler sent out an order convoking the commanders in chief of the three Armed Services and top Field Generals for a final all-day meeting on Barbarossa in Berlin on June 14. Despite the enormity of the task, not only Hitler but his Generals wee in a confident mood as they went over last-minute details of the most gigantic military operation in history, an all-out attack on a front stretching some 1,500 miles from the Arctic Ocean at Petsamo to the Black Sea. 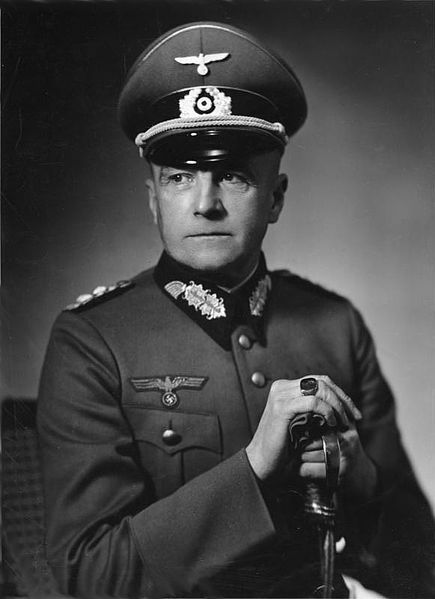 The night before , Brauchitsch had returned to Berlin from an inspection of the build-up in the East. Halder noted in his diary that the Army Commander in Chief was highly pleased. Officers and men. he said, were in top shape and ready. This last military powwow on June 14 lasted from 11 A.M. until 6.30 P.M. It was broken by lunch at 2 P.M., at which Hitler gave his Generals yet another of his fiery,eve-of-the-battle pep talks. According to Halder, it was 'a comprehensive political speech', with Hitler stressing that he had to attack Russia because her fall would force England to 'give up'. But he bloodthirsty Führer must have emphasised something else even more. Keitel told abut it during direct examination on the stand at Nürnberg: "The main theme was that this was the decisive battle between two ideologies and that the practices which we knew as soldiers, the only correct ones under international law, had to be measured by completely different standards". Hitler thereupon, said Keitel, gave various orders for carrying out an unprecedented terror in Russia by "brutal means". 'Did you, or did any other Generals, raise objections to these orders?' asked Keitel's own attorney. "No. I personally made no remonstrances", the General replied. Nor did any of the other Generals, he added. He was soon to get it. For on its way to him over the air waves between Berlin and Moscow was a long coded radio message from Ribbentrop, dated June 21, 1941, marked "Very Urgent, State Secret, For the Ambassador Personally", which began: "Upon receipt of this telegram, all of the cipher material still there is to be destroyed. The radio set is to be put out of commission. Please inform Herr Molotov at once that you have an urgent communiction to make to him... Then please make the following declaration to him". It was a familiar declaration, strewn with all the shop-worn lies and fabrications at which Hitler and Ribbentrop had become expert and winch had concocted so often before to justify each fresh act of unprovoked aggression. Perhaps it somewhat topped all the previous ones for sheer effrontery and deceit. While Germany had loyally abided by the German-Soviet Pact, it said, Russia repeatedly broken it. The USSR had practised 'sabotage, terrorism and espionage' against Germany. It had 'combated the German attempt to set up a stable order in Europe'. It had conspired with Britain 'for an attack against German troops in Rumania and Bulgaria'. By concentrating 'all availavle Russian forces on a long front from the Baltic to the Black Sea', it has 'menaced' the Reich. Reports received the last few days, it went on, eliminate the last remaining doubts as to the aggressive character of this Russian concentration... In addition, there are reports from England regarding the negotiation of Ambassador Cripps for closer political collaboration between England and the Soviet Union. 1. has not only continued, but even intensified its attempts to undermine Germany and Europe. 2.has adopted a more and more anti-German foreign policy. 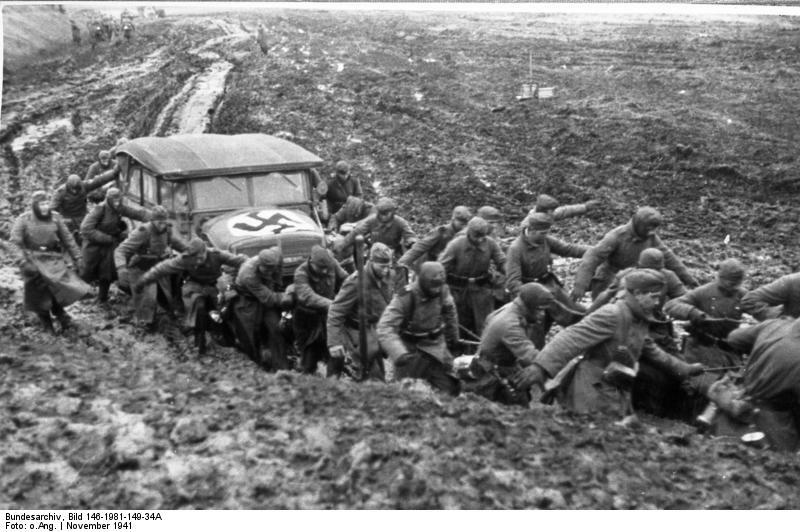 3.has concentrated all its forces in readiness at the German border. Thereby the Soviet Government has broken its treaty with Germany and is about to attack Germany from the rear in its struggle for life. The Führer has therefore ordered the German Armed Forces to oppose this threat with all the means to their disposal'. "it is war. Do you believe we deserve that?" Soviet statesman and one of the leaders of the Soviet State Security (GB) in the 1930s. Dekanozov was head of the NKVD foreign intelligence from December 2, 1938 to May 13, 1939, and then, from May 1939 to 1947, was assistant head of the People’s Commissariat (later Ministry) of Foreign Affairs.In late November 1940, Dekanozov was appointed Soviet Ambassador to Berlin (while remaining the Deputy People’s Commissar of Foreign Affairs) – remaining in that position until the Nazi attack against the Soviet Union on June 22, 1941. During 1941, he became a full member of the party’s Central Committee. 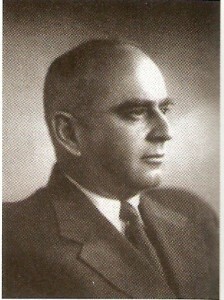 It is a common wisdom in Russia that as an ambassador, Dekanozov proved unable to appraise the situation and evaluate the Nazi plans against the Soviet Union. In fact, according to recently published documents, Dekanozov DID appraise the situation and warned his immediate boss, Molotov, of the Nazi plans to attack the Soviet Union. He died 1953. German troops in Russia, 1941"
The arrogant German Foreign Minister thereupon explained that the question was, gave the ambassador a copy of the memorandom which Schulenburg at that moment was reading out to Molotov, and informed him that German troops were at this instant taking 'military countermeasures' on the Soviet frontier. The startled Soviet envoy, says Schmidt, 'recovered his composure quickly and expressed his 'deep regret' at the developments, for which he blamed Germany. 'He rose, bowed perfunctorily and left the room without shaking hands. The Nazi-Soviet honeymoon was over. At 3:30 A.M.on June 22, 1941, a half hour before the closing diplomatic formalities in the Kremlin and the Wilhelmstrasse, the roar of Hitler's guns along hundreds of miles of front had blasted it forever. Thee was one other diplomatic prelude to the cannonade. 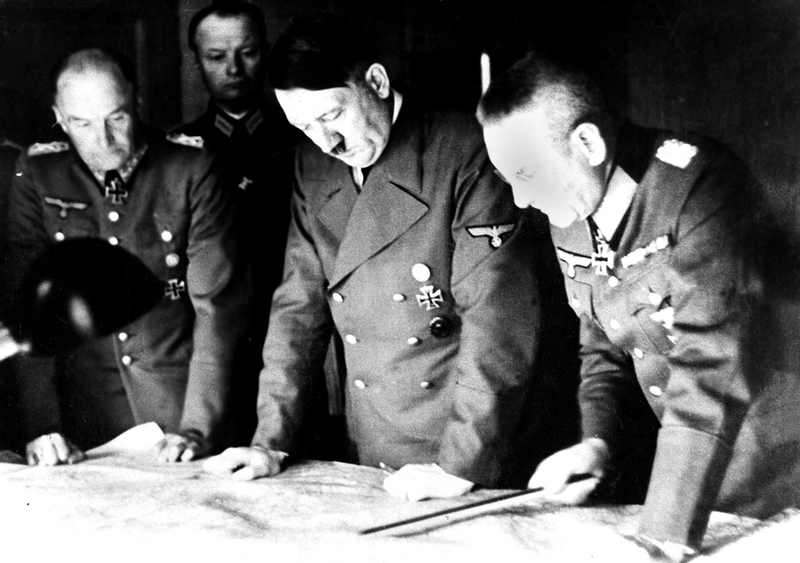 On the afternoon of June 21, Hitler sat down at his desk in his new underground headquarters, WolFsschanze (Wolf's Liar), near Rastenburg in a gloomy forest of East Prussia, and dictated a long letter to Mussolini . As in the preparation of all his other aggression he had not trusted his good friend and chief ally enough to let him in on his secret until the last moment. Now, at the eleventh hour, he did. His letter is the most revealing and authentic evidence we have of the reasons for his taking this fatal step, which for so long puzzled the outside world and which was to pave the way for his end and that of the third Reich. The letter, to be sure, is full of Hitler's customary lies and evasions which he tried to fob off even on his friends. But beneath them, there emerges his fundamental reasoning and his true, if mistaken, estimate of the world situation as the summer of 1941, the second of the war, officially began. Then came the excuse for not tipping off his partner earlier. 'If I waited until this moment Duce, to send you this information, it is because the final decision itself will not be made until 7 o'clock tonight...Whatever may come, Duce, our situation cannot become worse as a result of this step, it can only improve... Should England nevertheless not draw any conclusion from the hard facts, then we can, with our rear secured, apply ourselves with increased strength to dispatching of our enemy. Hitler forced countries to become allies with Germany during Operation Barbarossa. When Romania and Hungary joined Germany’s list of allies, Russians accused Berlin of violating the spirit of the 1939 pact. Hitler also was able to strengthened his allies by signing a new military alliance with Italy and Japan called the Tripartite Pact. Hitler used his allies for resources as well. Poland was used for supplies of iron, nickel, and other agronomies. Finland wanted revenge against Russia after the Red Army defeated them in 1939, so they too became allies with Germany. 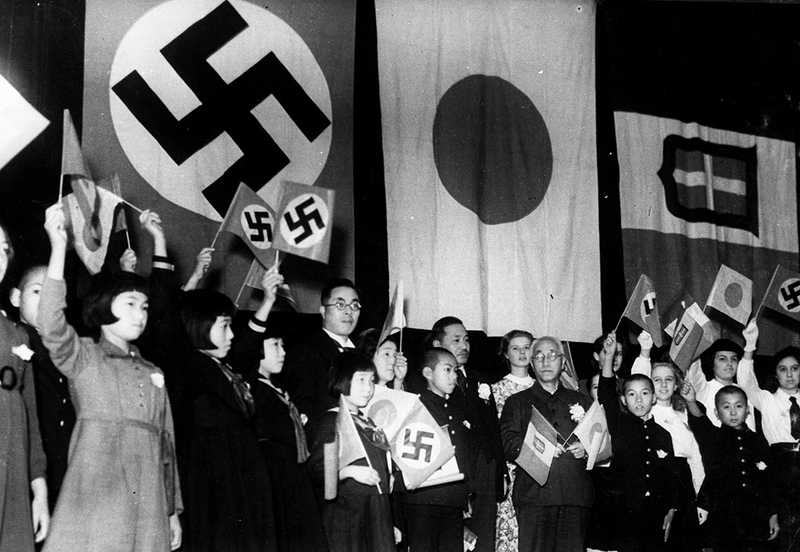 Children of Japan, Germany, and Italy meet in Tokyo to celebrate the signing of the Tripartite Alliance between the three nations, on December 17, 1940. Japanese education minister Kunihiko Hashida, center, holding crossed flags, and Mayor Tomejiro Okubo of Tokyo were among the sponsors. The second member of the Axis was Japan. Th story of the relationship between Hitler's Germany and imperial Japan involved a series of up and downs. Germany sought better relations with Japan initially for economic reasons. The relationship between Germany and Japan steadily improved as both countries were drawn closer by tension with the Soviet Union. Japan, along with Italy, signed the Anti-Comintern Pact, a treaty theoretically directed against the the Soviet Union, but in reality nothing more than a symbolic gesture. In Japan's case, tensions with the Soviet Union broke out into the open warfare along he border between Soviet controlled Mongolia and Japanese dominated Manchuria. The ensuing fighting resulted in two severe dubbing's of the Japanese by the Red Army. The Japanese, however, evaded attempts by Ribbentrop to bring Japan into a formal alliance with Germany. The Germans were also annoyed by what they regarded as unwelcome attempts by Japan to mediate between Germany and Poland. The relationship improved mainly due to the opposition to communism through the Anti-Comintern Pact and secondly the military alliance through the Tripartite Pact. Both nations had been adversaries during WW I and these agreements settled previous animosity between the nations through Yosuke Matsuoka's visit to Berlin, a German delegation was sent to Tokyo to celebrate the Tripartite Pact's signing, and through the Japanese ambassador to Germany Hiroshi Oshima among other correspondences. Gemany's declaration of war further solidified German-Japanese relations and showed Germany's solidarity with Japan and encouraged Japanese cooperation against the British. At 3 0'clock in the morning of June 22, a bare half hour before the German troops jumped off, Ambassador von Bismarck awakened Ciano in Rome to deliver Hitler's long missive, which the Italian Foreign Minister then telephoned to Mussolini, who was resting at his summer place at Riccione. It was not the first time that the Duce had been awakened from his sleep in the middle of the night by a message from his Axis partner, and he resented it. 'Not even I disturb my servants at night', Mussolini fretted to Ciano, 'but the Germans make me jump out of bed at any hour without the least consideration'. Nevertheless, as soon as Mussolini had rubbed the sleep from his eyes he gave orders for an immediate declaration of war on the Soviet Union. He was now completely a prisoner of the Germans. He knew it and resented it. 'I hope for only one thing', he told Ciano, 'that in this war in the East the Germans lose a lot of feathers'. Still, he realised that his on future now depended wholly on German arms. The Germans would win in Russia, he was sure, but he hoped that at least they would get a bloody nose. He could not know, nor did he suspect, nor did anyone else in the West, on either side, that they would get much worse. On Sunday morning, June 22, the day Napoleon crossed the Niemen in 1812 on his way to Moscow, and exactly a year after Napoleon's country France, had capitulated at Compiegne, Adolf Hitler's armoured, mechanized and hitherto invincible Army poured across the Niemen and various other rivers and penetrated swiftly into Russia. The Red Army, despite all the warnings and warning sites, was, as General Halder noted in his diary the first day, 'tactically surprised along the entire front'. All the first bridges were captured intact. In fact, says Halder, at most places along the border the Russians were not even deployed for action and were overrun before they could organize resistance. Hundreds of Soviet planes were destroyed on the flying fields. Within a few days tens of thousands of prisoners began to pour in, whole armies were quickly encircled. It seemed like the "Feldzug in Polen"all over again. 'It is hardly too much to say', the usually cautious Halder noted in his diary on July 3 after going over the latest General Staff reports, 'that the "Feldzug" against Russia has been won in fourteen days'. In a matter of weeks, he added, it would all be over.